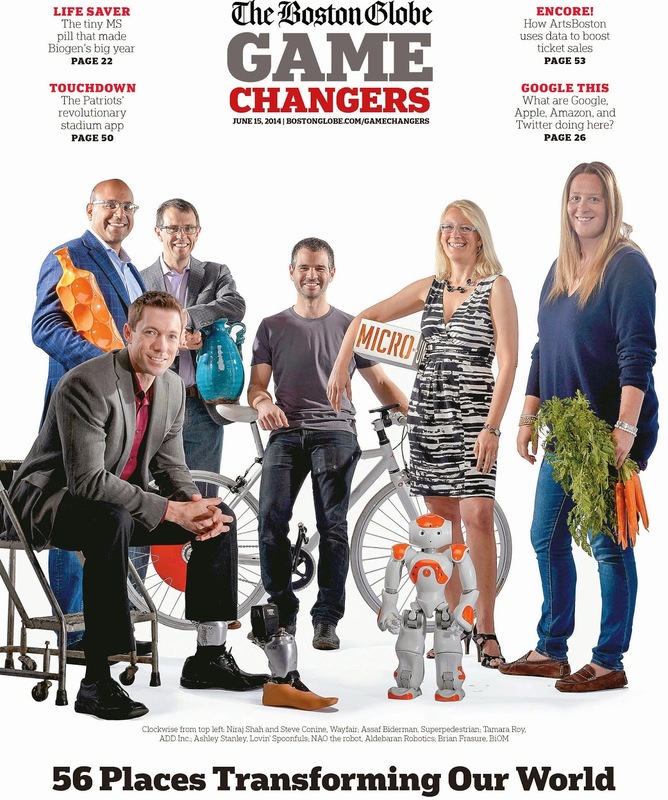 Urbanica was selected by Boston Globe to be this year's "Game Changer", a designation for any corporation (private or public), academic institution, health care provider, nonprofit, or startup with a Massachusetts presence in 2013 that accomplished something remarkable or cool. According to Mark Porthier, the Boston Globe business editor, the inaugural 56 Game Changers are the embodiment of that definition, and the Globe is eager to highlight their tremendous contributions to the economy and Massachusetts’ status as a hotbed of innovation. Urbanica was selected based on its accomplishment at 226-232 Highland Street E+ Townhouses, where the firm turned a vacant lot in Roxbury into four energy-efficient homes that generate more power than they consumed. The $1.5 million project on Highland Street was Boston’s first energy-positive residential building and inspired the city to want to build dozens of similar carbon-free units. Click [HERE] for the rest of the magazine at Boston Globe Game Changers site. AB Lofts by Urbanica project at Washington Street is a proposed mixed use building in Dudley Square, Roxbury, MA. The proposed building consists of 24 rental apartment units (23,930 square feet +/-), a 1,650 square feet +/- ground floor commercial space and 13 off-street parking spots. The building is five stories in height. The ground floor commercial space is envisioned as an active community event space that will be curated by a local community partner, Discover Roxbury in collaboration with Urbanica, to highlight the rich and diverse cultural heritage of Dudley Square and the Roxbury neighborhood. Spurred by the construction of the new Boston Public Schools Headquarters at the historic Ferdinand Building as well as other public-private development projects in the area like Bartlett Yard, Parcel 3, 9 and 10, Dudley Square is quickly emerging into a thriving commercial center of Roxbury. Roxbury, called the geographic heart of Boston and the Dudley Square area and situated less than two miles from downtown Boston, is one of the city’s most diverse neighborhoods in terms of culture, language, religion, and socio-economic backgrounds. This dynamic, urban hub has long been the historic center of African-American culture in the Commonwealth. Dudley Square is also a multi-modal transportation hub, with an abundance of public transit services like 16 bus lines and the Rapid Transit Silver line, connecting the area to Downtown Boston, Logan International Airport, and other neighboring towns including Cambridge and Brookline. The commercial space planned for AB Lofts will be well connected to a wider network of economic and cultural activities within the region. 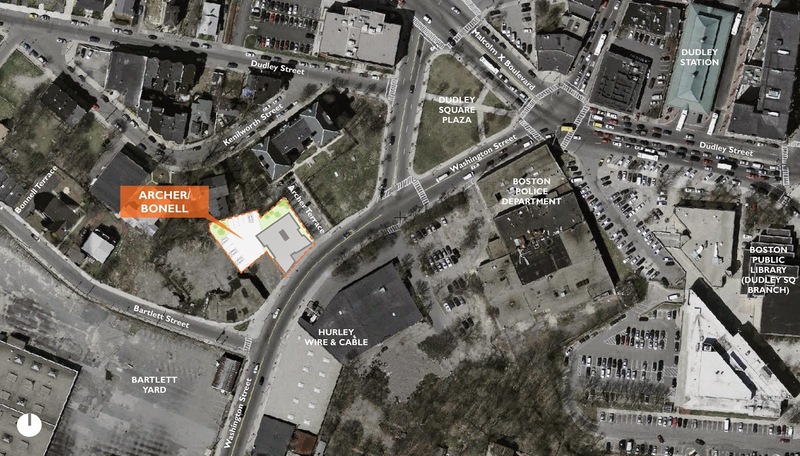 Our proposed project will bring vital energy and activity to the street level by providing a venue for community programming that will be curated by a local community group, Discover Roxbury in collaboration with Urbanica. The ground floor open plan layout will be designed as a flexible event space for exhibitions, meetings, workshops or performances. The ground floor commercial space will also include storage, administrative offices, and common amenities for the building’s tenants. The space will be ideal for fostering interaction within the community and a catalyst for greater grassroots endeavors and sustainable economic development in the neighborhood. The AB Lofts Building by Urbanica looks to the scale and texture of the local context for its design inspiration. The immediate building context is made up of a mix of single-story industrial buildings and some mid-sized institutional uses such as the former Dillaway School (present Schoolhouse Kenilworth Williams Apartments). Based on the historic Bromley Atlas map from 1899, the pre-existing building was a rectangular 4-quadrant type building situated within the larger of the two plots [Plots 0903168000 and 0903169000]. AB Lofts follow closely the planning of the pre-existing building. The AB Lofts building also reflects the dimension and vertical proportion of an end wing of the former school building. Though the overall massing of the building is cubic, the proposed building is broken into two smaller scaled wings to achieve this look. In addition to reflecting the overall massing of the former school building, the AB Lofts Building window pattern and exterior color reinterprets the existing façade material palette. The other main design influence for our project comes from the mix of industrial and residential buildings that characterizes the neighborhood. We interpret this program mix as having the potential for an emerging arts district. In fact, many successful arts districts begin as industrial areas which are later adapted to new uses. Artists and creative professionals are drawn to buildings with large, open spaces at relatively affordable costs. This part of Roxbury seems poised to undergo this kind of transformation by drawing upon the rich cultural and artistic heritage of the area. To this end, we envision the AB Lofts Building as a catalyst to a rapidly redeveloping area. Though our proposed building is not large, as one the first of many more buildings to come, it can set the stage for future development with its progressive, contextually-driven design and its functional programming. Moreover, the building will be a model for energy-efficient design and will be LEED-certifiable. Following Urbanica’s track record of creating quality buildings, the building construction techniques and materials will be of good quality and take advantage of the good building practices that Urbanica learnt from the E+ (Energy positive) building prototype by minimizing energy consumption and using sustainable and green techniques. The AB Lofts Building consists of four floors of open, loft-style residential units sitting on top of an inviting, transparent commercial base. The ground floor space will be occupied with a community-oriented arts and cultural space for the neighborhood, curated by Discover Roxbury in collaboration with Urbanica.